Bûche de Noël Take my hand, 2018, we’ll make it I swear. 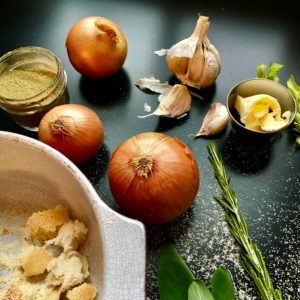 In my hands, Turkey Stuffing isn’t a very precise thing – I think it’s one of those subjective foods that every family – or every person – likes done differently. It’s a recipe that I’ve been helping out with since I was a kid, as small hands are good for tearing loaves of bread into small chunks, and it’s sometimes a whole family effort, as you consult everyone to make sure it looks/smells right before going in to the oven. As a kid, I was a huge fan of my Grandma Shaw’s extremely peppery stuffings, though I think I was the only one who liked it like that. Because my sisters are vegetarians, we’ve never experimented with sausage or animal fats in our stuffing; it’s entirely vegetarian, and while some of it gets stuffed in the bird for the omnivores, the rest goes in an oven-safe bowl, wrapped in tinfoil, to cook meat-free. This is how we like it – let me know in the comments what you do with your turkey stuffing! I’ve been listening to Christmas music a lot in the past few weeks, and was recently searching for some variations and older music, to get away from the handful of standards you hear over and over at this time of year. There’s a great album by a vocal group called Anonymous 4 – On Yoolis Night – it’s Medieval Christmas music, and its great for quiet times. You can listen to it online if you follow this link! 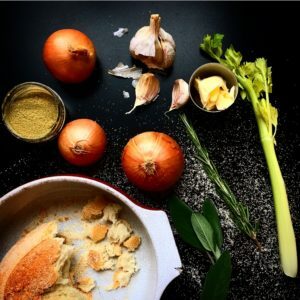 salt and pepper to taste – don’t forget salt! Using your hands, tear up the bread into small pieces, usually about the size of a quarter or less. Fry half of the diced onion. Add fried onion, raw onion, garlic, butter, celery, poultry seasoning, celery salt, and salt and pepper to bread. 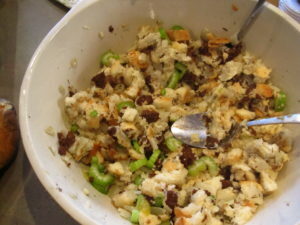 Pour water into stuffing mixture, just enough to wet the contents. If stuffing into a turkey, fill turkey cavity with stuffing, and cook turkey according to cooking times with stuffing (times vary, but are slightly longer with a stuffed bird). If baking separately, put stuffing mixture into a baking dish and cover with tinfoil. Roast turkey according to roasting times when stuffed – this is usually slightly longer than an un-stuffed bird. Bake the stuffing in the baking dish for approximately 30 minutes at 325ºF, removing the tinfoil for the last 5-10 minutes to get a nice brown top.